"You have got to be kidding me! I knew they couldn't kill the dragon!" Bruce Lee is a legendary fighter and star who's light went out way too soon. Many people still look to him and his style as something of an inspiration, but what if he were still around today? That's a question that Bruce Lee: The Dragon Rises from Darby Pop Publishing seeks to answer. The issue is written by Shannon Lee and Jeff Kline, illustrated by Brandon McKinney, colored by Zac Atkinson and lettered by Troy Peteri. Bruce Lee never died. And he hasn't aged. But, Bruce has no idea who he is or why so many "thugs" want a piece of him. Readers going into Bruce Lee: The Dragon Rises will probably have no idea what they're getting into, but fortunately Lee and Kline make things obvious from the start. The concept of Bruce Lee being cryogenically frozen and then awoken by a seemingly inept guard is somewhat comedic in its own right while also setting the lighthearted nature of the book. There's a buddy cop aspect in pairing Bruce Lee up with Joe Toomey as well that Lee and Kline rely on to give Bruce Lee's amnesia some more entertainment value. Lee and Kline further infuse the story with an all-ages appeal through the addition of the young students are helping him to find his way in a much different world. The dialogue adds plenty of levity to the story and keeps the pace moving along as well. An all-ages book doesn't work if the artwork is too grim and McKinney's efforts are pretty perfect in terms of keeping things light. His style lends the issue a Saturday morning cartoon feel that further buoys the general good-nature of the characters and their interactions. Characters are the focus in all the panels as McKinney gives them plenty of attention as they stand out against relatively sparse backgrounds that are detailed enough to convey the setting. The panels range in terms of their layout, with McKinney going back and forth between more standard grids and some overlays/insets. Atkinson's colors are bright and vivid, again contributing to the notion that the book is geared for readers of all-ages. The premise behind Bruce Lee: The Dragon Rises is a little hokey, but it works. Bruce Lee is forced to learn more about his surroundings and the new world while also coming to terms with his reputation as one of the foremost martial arts experts in history. The premise of the story by Lee and Kline is sort of a buddy cop take that's given a fun twist by mixing in someone like Bruce Lee. The illustrations by McKenne are clean and airy, reinforcing the notion that the story is meant to be enjoyed and not really overanalyzed. 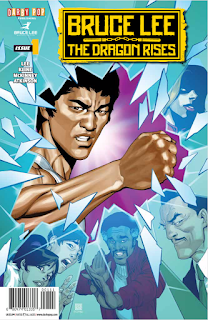 Bruce Lee: The Dragon Rises will appeal to readers of all ages and draws upon a pretty enjoyable twist on a legend. 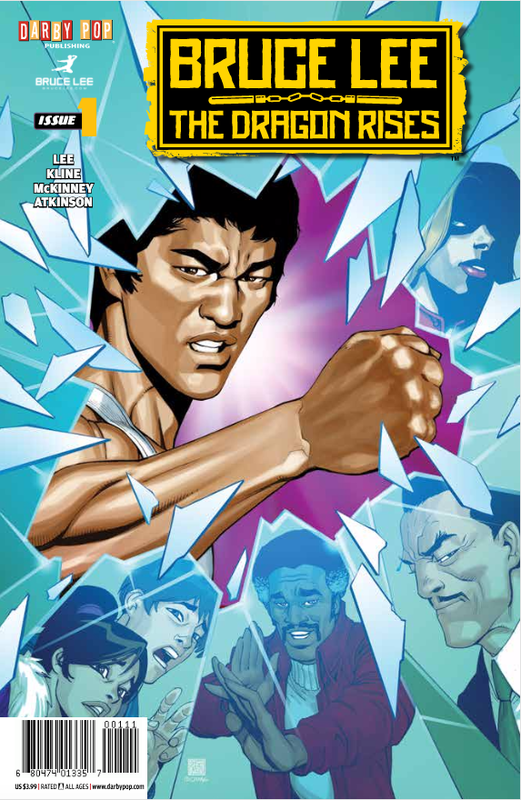 Bruce Lee: The Dragon Rises is in stores now.